The Weimaraner dates back to the early 19th century where they were developed in Weimar, Germany. The noblemen who bred them loved to hunt and wanted a dog with courage, intelligence, stamina, speed, and good scenting ability. 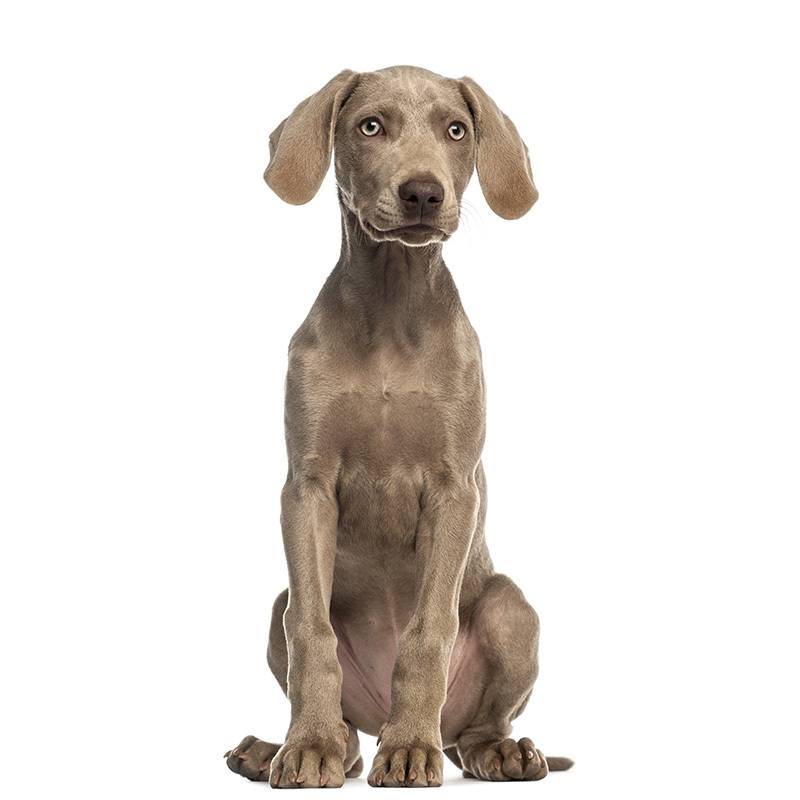 The breeds they used to create the Weimaraner include the Bloodhound, the English Pointer, the German Shorthaired Pointer, the blue Great Dane, and the silver-gray Huehnerhund, or chicken dog. They were originally bred as big-game hunters for bear, deer, and wolves, but they eventually hunted birds, rabbits, and foxes. They were and are excellent pointers and all-around hunters. Weimaraners made their way to America in the early 1900s, and then after World War II many American servicemen brought Weimaraners home with them where they quickly grew in popularity. 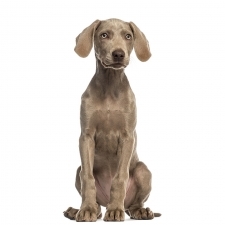 Weimaraners can be friendly, happy, fearless, intelligent, curious and playful. They are very good with children and can be extremely attached to their family. They require a lot of attention, and they become deeply attached to their owners and will want to follow them everywhere. They make great watch dogs and are very protective of their families. Weimaraners have an incredible level of energy, and they need to run everyday. They enjoy almost all activities, including jogging with you, running alongside your bike, hiking with you, swimming, agility, and retrieving. It is said that no one has reported something a Weimaraner couldn’t do. On the flip side, these dogs cannot be ignored. If ignored, they can bark excessively, soil the house, or just plain destroy your house in minutes! They have been known to chew, chase cats, and steal food off the kitchen counter. They need to be well socialized to counter these tendencies. Owning a Weimaraner is a full-time job, but one that pays off in dividends if they are well treated and well trained. A Weimaraner first appeared in a Van Dyck painting in the early 1600s. President Dwight D. Eisenhower brought his Weimaraner Heidi to the White House. The TV show Sesame Street often plays skits and dresses up Weimaraners in human clothes. They make excellent police, service for the disabled, and search and rescue dogs.